Also called Asian, Chinese or Panax ginseng, Korean ginseng is a common medicinal herb for treating a range of health ailments. Korean ginseng tea may be helpful if you have erectile dysfunction, male infertility, diabetes, chronic fatigue syndrome, colds, infections or flu. You can also take Korean ginseng to boost your immune system and athletic performance. Korean ginseng does have several side effects, however, and they may be mild to potentially dangerous. Korean ginseng may have negative side effects on your blood pressure and heart rate. People have reported experiencing increased heart rate and elevated blood pressure after taking excessive doses of Korean ginseng, says the University of Pittsburgh Medical Center. Some people have reported experiencing tachycardia after taking Korean ginseng, notes the Memorial Sloan-Kettering Cancer Center. If you have high blood pressure that isn't controlled with medications, consult your physician before taking Korean ginseng, because it could increase your blood pressure, according to the University of Michigan Health System. People have reported experiencing insomnia and nervousness while taking Korean ginseng, says the Memorial Sloan-Kettering Cancer Center. If you consume caffeine with Korean ginseng, you could increase your risk of these side effects, which are due to overstimulation, says the University of Michigan Health System. Some other reported side effects of taking Korean ginseng or drinking the tea are nausea, vomiting, diarrhea and dry mouth. Korean ginseng may produce estrogen-like effects in your body. Although reports have been rare, a few cases involved women who experienced postmenopausal vaginal bleeding, menstrual irregularities and breast tenderness after using Korean ginseng, according to the University of Pittsburgh Medical Center. These side effects can occur usually after long-term use of Korean ginseng. If you're pregnant or lactating, you shouldn't use Korean ginseng. Also, if you have any kind of disease or condition that's affected by hormones, such as estrogen-sensitive breast cancer, you shouldn't drink Korean ginseng tea. Korean ginseng stimulated breast-cancer cell growth in one test tube study. Taking Korean ginseng may interfere with your blood platelets and their clotting tendencies, potentially causing blood clots. A double-blind clinical trial and one case report have indicated that Korean ginseng could reduce the effectiveness of Coumadin, a blood thinner, says the University of Pittsburgh Medical Center. Avoid drinking Korean ginseng tea if you take anti-coagulants, or "blood thinning" medications, because doing so could increase your risk of developing a dangerous blood clot, according to the Memorial Sloan-Kettering Cancer Center. Long-term use of Korean ginseng may put you at risk of episodes of mania. One case report involved a 26-year-old man who had no history of psychiatric illness and became manic after taking Korean ginseng, says the Memorial Sloan-Kettering Cancer Center. The man took 250 milligrams of Korean ginseng three times daily over a long period, but his mania subsided when he stopped taking the ginseng. 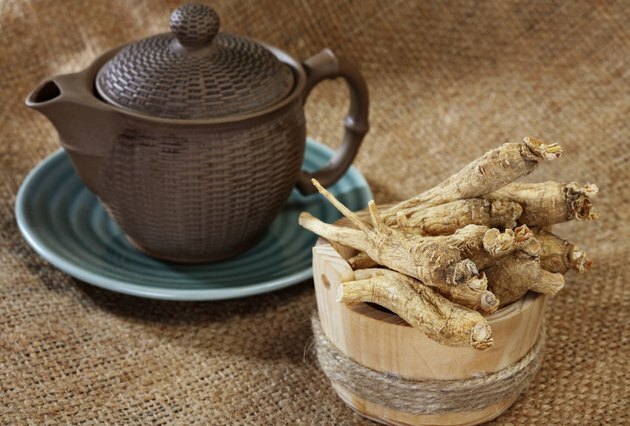 The University of Pittsburgh also points to two other case reports suggesting that taking Korean ginseng while taking certain antidepressant medications could cause manic episodes. If you take certain psychiatric medications, particularly monoamine oxidase inhibitors, or "MAOIs," you shouldn't take Korean ginseng. Taking Korean ginseng tea could reduce your blood glucose levels and cause hypoglycemia in some people, according to the University of Pittsburgh Medical Center. If you have diabetes, you may be at a higher risk of hypoglycemia, especially if you're taking certain diabetic medications. The combination of diabetes medications and Korean ginseng may cause your blood sugar levels to decrease too much. Due to this potential side effect and risk of hypoglycemia, avoid taking Korean ginseng if you take insulin or other blood sugar-lowering medications like sulfonylureas, the Memorial Sloan-Kettering Cancer Center says. How Much Sage Tea to Drink?